Women On A Roll offers boutique, luxury travel for lesbians and their female friends. Each journey brings 15 to 50 guests together to share extraordinary destinations and unique experiences, customized to fit our desires and our lifestyle. You’ll return with a whole new set of friends and shared memories to last a lifetime! 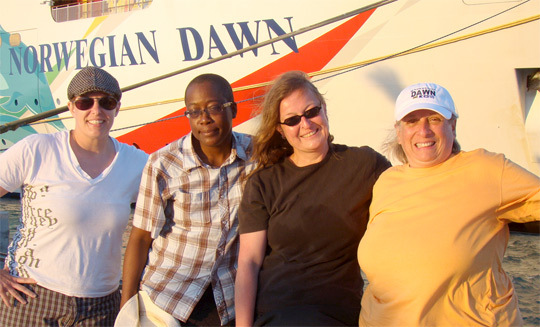 Pride of the Ocean is proud to support Women On A Roll, founded by filmmaker Andrea Meyerson in 1995, for Women On A Roll’s pioneering work by inviting WOAR supporters to join us for the important screenings on Pride of the Ocean. Each Women On A Roll supporter who registers with Pride of the Ocean will be invited to an Exclusive Cocktail Party with Andrea Meyerson, (founder of Women on A Roll) and Susi Walsh (exec. director of The Center for Independent Documentary), and will receive a $75 cabin discount from their cruise package. It’s easy to take advantage of this special offer. Simply enter your Women On A Roll Promo Code, found in the line following this paragraph, on your Pride of the Ocean online registration form here. WOAR19 for Women on a Roll members, who will receive a $100 cabin discount. WOAR19VET for Women on a Roll members who are also Military Veterans, who will receive a $150 cabin discount. If you have any questions, contact our travel associate Geisha Cumberbatch or call toll free: (866) 432-0050. Women on the Roll members are welcome to participate in all the Pride of the Ocean Film Festival events, including our two group dinners and exclusive cocktail parties. If you would like to bring your friend, partner, or business associate, we will be glad to extend the Women On A Roll Special Offer to your cabin mate as well.